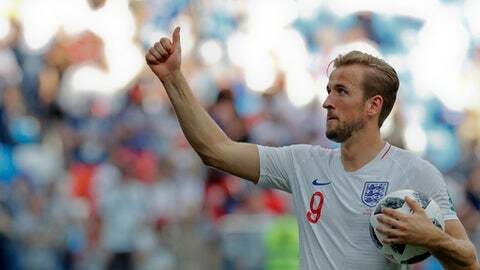 NIZHNY NOVGOROD, Russia (AP) Harry Kane led England into the round of 16 at the World Cup then gave a nod to Scottish DJ Calvin Harris. Kane was asked after England’s 6-1 victory over Panama to pick a song to play on a Brazilian program as reward for his hat trick in the victory. Caught off guard by the request, the striker mulled the question from the Brazilian reporter. ”I’ll go `One Kiss’ by Calvin Harris and Dua Lipa,” he offered Sunday. Dua Lipa is British, and both she and Harris were thrilled with Kane’s selection. ”Yes I’m Scottish but I don’t care the legend Harry Kane picked our song,” Harris posted on Twitter with a clip from Kane’s post-match news conference. Dua Lipa acknowledged the shout-out by reposting a tweet about Kane’s selection. Fans of both the soccer player and the artists also flooded social media supporting Kane’s song choice.